VMware vSAN performance monitoring is designed to provide quick visibility into clusters with health and performance issues. Monitor storage consumption rates, derive patterns, and forecast capacity requirements to help avoid vSAN performance issues. Get help understanding what storage space savings you are gaining from deduplication and compression functionality. 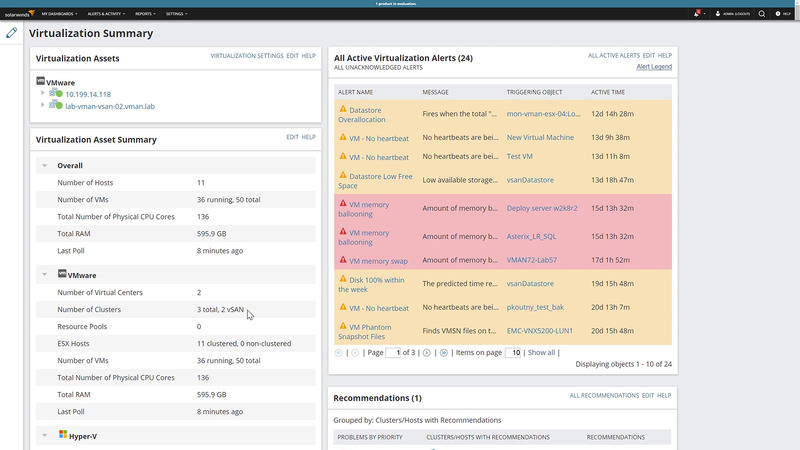 Quickly identify and diagnose problems that slow data center performance with clear visibility of your VMware vSAN SolarWinds® Virtualization Manager (VMAN) is built to track performance history, finds bottlenecks, and troubleshoot VMware vSAN performance issues before they impact applications. Know which clusters have failed health checks and which VMs are experiencing the most latency with comprehensive VMware vSAN monitoring, so you can focus on what needs immediate attention. Virtualization Manager can help you monitor your vSAN capacity to ensure you have enough space to support your virtual machines (VMs). Part of that VM capacity calculation is understanding how much space is consumed by vSAN overhead, which VMAN can clearly communicate. This allows you to understand capacity more efficiently, moving away from more manual processes. Deduplication and compression work together to reduce redundant data so you can reclaim valuable storage space. But it’s hard to quantify those savings as data moves from the cache to the capacity tier. Virtualization Manager tracks and shares this information to help give you a better understanding of overall storage savings and help improve VMware vSAN performance. Comprehensive VMware vSAN monitoring, performance management, capacity planning, and optimization. Performance bottlenecks in the VMware vSAN storage environment can be a serious threat to application and data center performance. Manual capacity planning processes can create long hours and sometimes leads to inaccurate predictions. It can be difficult to understand storage space savings from deduplication and compression. VMware vSAN monitoring software monitors the performance of your software-defined storage environment and allows you to investigate and remediate any issues.